One of my male teachers has repeatedly made a joke about girls belonging in the kitchen. Usually, he’d make that comment, some girls in my class would jokingly yell “hey!” and he’d laugh, say he’s joking, then move on. He did this a few times and then moved on to making more sexist jokes regarding his wife. I expect this from dumb teenage boys but not from a teacher, so I finally got annoyed enough that after the third time this happened I went to his desk after class and asked him to stop telling sexist jokes. It wasn’t supposed to be a big deal since I knew he was joking (even if his “jokes” were sexist and not funny). Well he was extremely caught off guard and seemed to feel really bad about it. He told me he was sorry if he offended me and REPEATEDLY told me that he thought very highly of his wife, that he was just joking and didn’t mean anything by it. But that’s the point: Why are sexist jokes so normalized? It’s so frustrating how sexism is so accepted as a part of everyday conversation to the point that it basically goes so unnoticed. I know he would never make racist jokes or comments like that, and if he did, people would speak up and tell him not to joke about those things because it’s offensive and wrong. The same usually goes for “gay” jokes or calling something “gay” — students (at my school at least) usually speak up and say that those comments are offensive. But it’s still just considered a funny joke when you say demeaning things about women, or it’s completely acceptable to call a guy a “sissy”, as if being like a girl is acceptably insulting. Now I just get so incredibly fed up when I hear things like this. 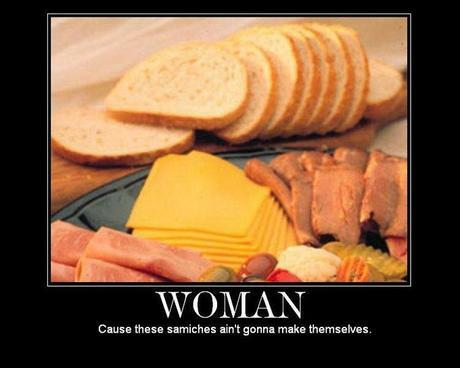 I can’t tell you how many decent, intelligent guys I have heard make “go make me a sandwich” jokes even though I think we can all agree that they’re really not clever or are actually funny. People don’t seem to realize that telling sexist jokes are one of many little things that contribute to subconsciously putting us in the mindset that women are inferior and belong at home. If you don’t speak out against a sexist joke, you are being passively sexist. If you TELL a sexist joke, you are being actively sexist. Of course, we need to stop telling any and all types of offensive jokes, but I feel like sexist jokes are the ones taken the most lightly and the ones that go unnoticed most often. Don’t let them: the next time you hear a sexist joke, speak out against it and make the person telling it actually think about what they’re saying.